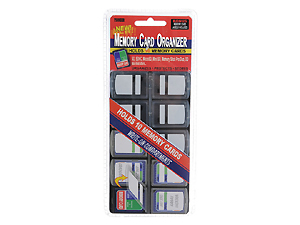 Organize, protect and store all of your memory cards in one place with this Pioneer Memory Card Organizer. Organize, protect and store all of your flash memory cards in one place with this Pioneer Flash Card Holder. Holds SD, SDHC, MicroSD, MiniSD, Memory Stick Pro Duo, XD & many more! Includes write-on, removable labels to easily identify memory card contents. Dimensions: 5-1/8"W x 3-1/8"H x 3/16"